Each piece of Sunset Hill Stoneware is made using an old-world process that gives each its unique, handcrafted appearance and quality. Unlike other potteries, Sunset Hill Stoneware's products are made one at a time, hand thrown on the potter's wheel rather than using slip cast molds. Master potters throw each piece of Sunset Hill Stoneware using the finest clays and glazes. Slight color and size variations that may occur showcase the unique properties that make your stoneware truly one of a kind. Each piece of stoneware is created with high-fired clays and the finest quality lead-free glazes. Under normal use, these durable pieces are oven-safe & microwave-safe. 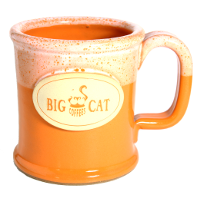 Big Cat recommends hand washing this stoneware mug. This hand thrown piece of stoneware was crafted in the USA!